I’ve covered the legendary Funskool Super Cop figure in the past. Legendary, you say? Well, I believe he is. In fact, I think he dwells in that ratified atmosphere of greatness previously inhabited only by the likes of Big Brawler and Chinese Major Bludd. A highway patrolman who accessorizes with fur gauntlets is a bad man in my book. Super Cop was so well thought of in India that he had his own vehicle multi-pack, a colorful collection of personally themed and decorated repaints of GI Joe vehicles. Super Cop walked his beat in all fronts; land, sea and air. There was a VAMP, Silver Mirage, Devilfish, and this FANG. All were cast in a lovely shade of light blue and white, with themed (paper) stickers. I don’t remember if this thing has a name. If it doesn’t, I’m christening it the SuperCop-ter. What else would be fitting in this case? 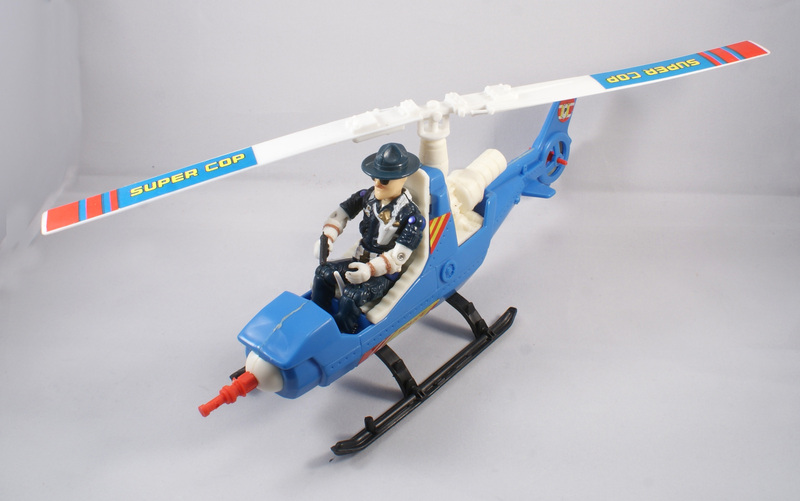 Now that I’m really thinking about it, does Super Cop even need an aircraft? He should just be able to to launch himself into the air using the abilities given him by his super Mirrored Shades and Moustache of Power. Being a Funskool vehicle, the copter isn’t up to Hasbro quality standards. The plastic feels thinner and cheaper, and the fit of the pieces isn’t quite what it once was. The front gun on my version looks like it was glued together as if it were a hastily assembled model kit. There’s even some gloppy glue around the seam. But hey, I didn’t pay much for the set back in the day, so I’m happy. Not to mention, I also got a Super Cop figure out of the deal. Win win. While I have no doubt that it’s probably a piece of crap, it doesn’t look too bad. I’m sure it would’ve been a fun little toy for a kid even if the coloring doesn’t mesh well with G.I. Joe. It’s likely that the Supercop you got in the set is a variant of the carded version. There were at least 4 and likely many more variants of the figure. Items like this are why Funskool was great. There’s no way a campy item like this would have been produced by Hasbro in the collector themed world we’ve occupied since around 1995. This seems like the type of thing Hasbro might have done in the Eighties and that gives it an innocence that surpasses the value as a toy. I really miss Funskool….moreso than even the Hasbro ARAH style repaints. I don’t know why, but adding in the vehicles, now I definitely see webcomic character Axe Cop when I see Super Cop. They’re both cops with mustaches and they’re both clearly super awesome. Love the post on the Super Cop-ter, Rob…well done. 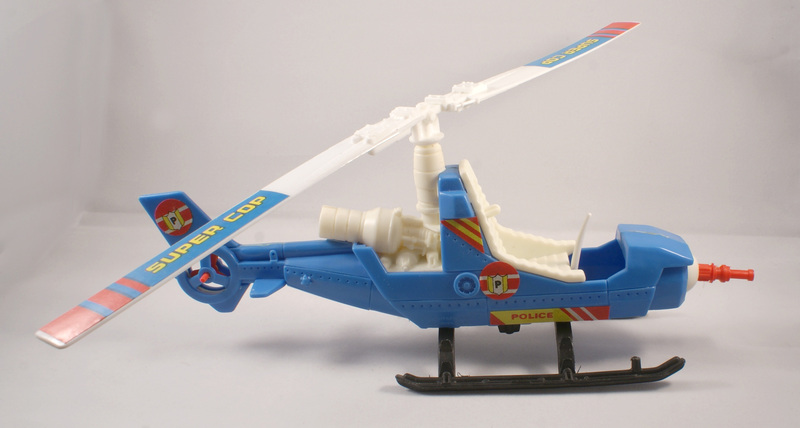 I don’t have this copter but I do have the Police VAMP and racing VAMP too. They don’t seem to suffer from the reduced qaulity issues you report here. That original FANG mold is timeless. It never goes out of style. Funskool rocks. My favorite figure of theirs is the purple and orange “Bomb Squad” Tripwire along with Windmill and Skydiver. ↑ +100 for referencing Axe Cop! Someone’s been dumping a bunch of repainted Funskool VAMPS onto eBay recently… except I think online stores (Smalljoes, most specifically) are buying them up for much higher prices than they probably should be going for. It’s rare to see one of these ‘copters in such good shape. When they come up for sale on the ‘Bay, they’re usually pretty beat. A lot of Funskool stuff is like that. Swap some labels, and you have a sort of Cobra Arctic Fang. People buying up Funskool to inflate its prices. No surprise. The surprise is that there’s that much of a market that’s willing to buy common Funskool items at high prices.